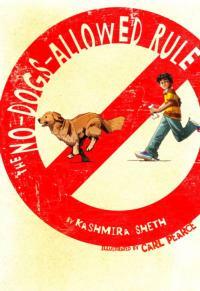 Ishan is desperate for a dog, but his perfect older brother Sunil doesn't think it will ever happen - and the more trouble Ishan gets into trying to convince his parents to get a dog, the more it looks like Sunil will be right. I'm always looking for new beginning chapter books and this one has lots of good points, even if it's not perfect. The writing can be a little choppy, often a problem for easy readers and beginning chapter books, due to the limitations of their formats. I found the ending, with Ishan's one smart move wiping out all his endless mischief and trouble a little unrealistic - and the trouble itself was a bit over the top. Some of Ishan's mentions of Indian culture are a bit info-dumpish as well. However, that's from an adult perspective. Kids will love this story. They'll completely understand Ishan's desperate desire for a dog. Giggle endlessly over his hapless mistakes and the things that just go wrong without him even trying, feel the frustration of his perfect older brother, and cheer when Ishan finally gets his dog. Ishan's explanations of Indian culture - his parents are desis, Indian-Americans, sound awkward if you've never actually listened in to a conversation involving second-generation immigrant children. I have, and this is actually really realistic for this younger age group. They'll drop a phrase or mention something, other kids will ask "what's that?" and they'll tell them, usually adding on an important "because my family comes from X country". Information exchanged, and the play goes on. Older kids get a big more angsty about this, but I've noticed that younger kids generally ask from a spirit of pure inquiry and then get on with whatever they're doing when they find out. Verdict: A nice length, interesting tidbits of information, and a plot that most kids will relate to, plus lots of funny moments - I think this one will be a great addition to our beginning chapter book collection. I wasn't able to fully review the art, since only some was included in the galley I saw and that was incomplete, but it looks attractive and the cover is certainly eye-catching. Recommended. One note - the publisher gives the publication date as September 1, but my vendor gives it as August 1 and I've ordered the title in my July list, so...order now I guess?